Our Peace Walk starts in tumult. Monday, usually the quietest day for shopping, and the streets are packed with half-term-holiday families. This walk sets out to consider our attitudes to peace, what makes a peaceful society and how the practicalities of peaceful living are often muddied, by reflecting on what we come across in Birmingham City centre. So it is a riotous start in the echoing Food Loft at the vegetarian outlet, Natural Choice, in the Pavilions Shopping Centre. Is it levels of noise that affect levels of peace in society? They might influence digestion. Ten people came on the walk including Rajagopal PV. He is on a European tour to develop links between organisations interested in non-violent change and his own organisation in India, Ekta Parishad (Unity Forum). Ekta Parishad was nominated for the Nobel Peace prize this year. Malala Yousafzai, Birmingham’s adopted daughter, was co-recipient, but the nomination for Ekta Parishad is recognition of the amazing work that they have done over twenty five years to build a social movement for land reform in India. Ekta Parishad shows its face in highly organised peaceful walking by thousands of people at a time, Gandhian-style; a massive back story for our small walk in Birmingham. MARTINEAU WALK, a new shopping development named after a family of lawyers with eight generations of mayors. Here we see an alleyway of international and fusion food restaurants, representatives of separate countries, different cultures. They gather to support each other in order to compete for the little passing trade; cohabitation for economic survival. PRIORY COURT is the civil court of reconciliation and arbitration for land disputes, small claims, family fallouts, bankruptcies. You are welcomed into the building with electronic frisking and an array of notices, there are no staff on the information desk. Nearby is the Square Peg pub, a graphic reference to difficulties experienced by institutional misfits. THE QUAKER PEACE HUB in Bull Street is opening its doors on 10 November. Each month will see a different campaign starting with a call for arms embargoes. There are meeting rooms for community organisations, resources for collaboration. We discuss the continuing necessity of grass roots organisations such as 38 Degrees that push for change where the state, social regulators, and financial institutions wink at, and even initiate, injustices, particularly against people without money or status. 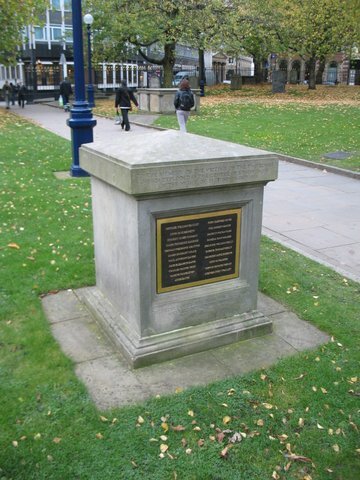 BIRMINGHAM CATHEDRAL GROUNDS have a memorial to those who died in the Birmingham Pub Bombings on 21 November 1974. A commemorative concert to mark the fortieth anniversary is planned. The fear generated by the bombings is not easily overcome by those who experienced them, and judicial processes at the time have since been found to be highly compromised. COLMORE ROW has yet-to-be lit christmas lights for Goodwill, Peace to All and seasonal shopping. A massive abandoned concrete brutalist office block is owned by British Land, one of the UK’s most prosperous landlords. British Land was founded in 1849 by John Bright, Quaker, radical liberal, and thirty one years MP for Birmingham, expressly to sell cheap plots to landless men so that they could have the vote. We pass the Cooperative Bank whose staff are required to live by its values, including self help and help for others, but whose livelihoods were recently threatened by poor financial governance. Rajagopal presents an Ekta Parishad scarf to The Lord Mayor, Cllr Shafique Shah. CHAMBERLAIN SQUARE. 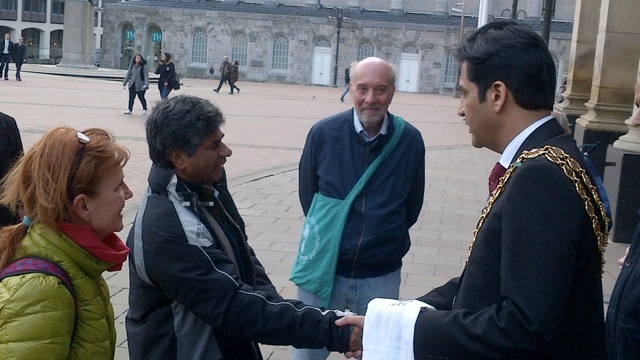 We meet the Lord Mayor of Birmingham, Cllr Shafique Shah, since the city is member of Mayors for Peace. 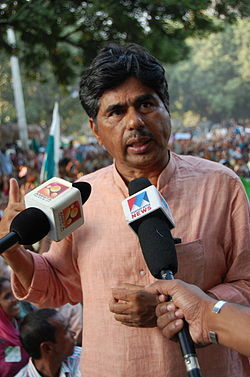 Rajagopal presents a simple cotton scarf printed in its distinctive green and white for Ekta Parishad’s 350km walk by 40,000 people in 2012. Cllr Shah describes the emotion of placing the first of 5,000 ice figures on the steps in the square on 2 August. They melted in the sun to mark a century since the start of World War 1. THE WAR POETRY COLLECTION at the Library of Birmingham is the largest of its kind. We handle a small selection of self publications by amateur poets and soldiers from WW1. There is an anthology published two years after the US invasion of Grenada in 1983. We discuss consciensious objection and the surprising range of Quaker involvement with war with Sian Roberts, a librarian with particular knowledge of the collection. The library has an exhibition, ‘Voices of War’, investigating the lives of Birmingham citizens during WW1. What conclusions? This walk was based very loosely on Birmingham City Centre Peace Trail. Leaflets are to be had from the Quaker Peace Hub and Birmingham Friends of the Earth. We found that we can simply look around us, at our institutions and people who pass by, and discuss what we see. This is enough to prompt thoughts, observations, questions about how we in our society pursue peace and yet often accommodate non-peaceful means to shaping our lives.